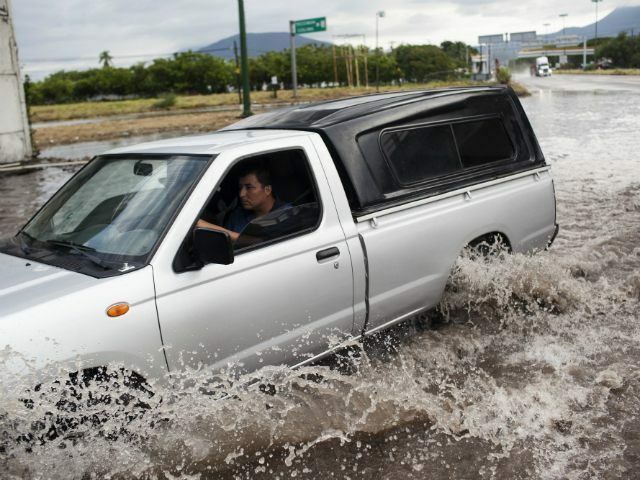 Across Mexico, they are counting the cost of the strongest hurricane ever recorded. It may be days before we know the full tally, but already we can guess from shocked eyewitness accounts that the damage from Hurricane Patricia could run into the many tens, if not hundreds of dollars. But, amid all the suffering that this truly terrifying non-event of a damp squib has caused since it made landfall in Mexico, let us reserve our most special prayers for the people it hit hardest of all, viz: all those climate alarmists who, before it struck, were confidently assuring us that this was going to be the hurricane to end all hurricanes; and one which, furthermore, would offer a brutal rebuttal to all those foolish enough to deny the reality of climate change. 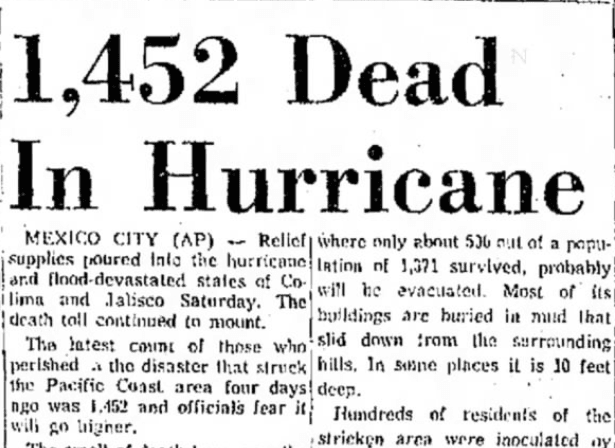 BY THIS TIME tomorrow, Mexico’s resort-speckled southwest coast will almost certainly have been thrashed by the strongest hurricane ever recorded. And the storm, unassumingly named Patricia, almost certainly owes its strength to a monster El Niño stacked atop climate change. and Slate‘s Eric Holthaus (a meteorologist – so he must know, right? ), who treated us to a taste of the kind of devastation we could expect from this strongest hurricane evah. Instead, where they had been predicting 200 mph winds, what they actually got was much less impressive. Forty miles from the storm in Puerto Vallarta, the windspeeds were about 14 mph. Obviously it would have been worse in the eye of the storm. But 200mph? Not even close. We know this because trees were not even stripped of their leaves at landfall – a reliable gauge of wind strength. 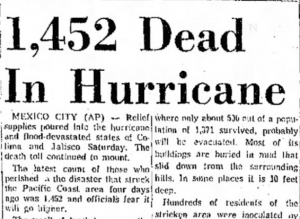 As for the claim that this was the strongest hurricane ever recorded – well, that’s largely a function of changing measuring equipment rather than changing climate patterns. Claimed “record wind speeds”, of course, rely on satellite measurements that we have only had for a few decades. Prior to that, we had to rely on ship and airplane measurements that were at best patchy, and tended to underestimate wind speeds as pilots were reluctant to fly into the centre of the most powerful hurricanes, understandably! Similarly, wind speeds on landfall relied on anemometors, which weren’t always where the highest speeds were, and too often were destroyed by high winds. About the most that can be claimed, therefore, is that Hurricane Patricia is the strongest hurricane in the Eastern Pacific in the last 30 years or so. CONCLUSIONS. To summarize, claims of linkages between global warming and hurricane impacts are premature for three reasons. First, no connection has been established between greenhouse gas emissions and the observed behavior of hurricanes (Houghton et al. 2001; Walsh 2004). Emanuel (2005) is suggestive of such a connection, but is by no means definitive. In the future, such a connection may be established [e.g., in the case of the observations of Emanuel (2005) or the projections of Knutson and Tuleya (2004)] or made in the context of other metrics of tropical cyclone intensity and duration that remain to be closely examined. Second, the peer-reviewed literature reflects that a scientific consensus exists that any future changes in hurricane intensities will likely be small in the context of observed variability (Knutson and Tuleya 2004; Henderson-Sellers et al. 1998), while the scientific problem of tropical cyclogenesis is so far from being solved that little can be said about possible changes in frequency. And third, under the assumptions of the IPCC, expected future damages to society of its projected changes in the behavior of hurricanes are dwarfed by the influence of its own projections of growing wealth and population (Pielke et al. 2000). While future research or experience may yet overturn these conclusions, the state of the peer-reviewed knowledge today is such that there are good reasons to expect that any conclusive connection between global warming and hurricanes or their impacts will not be made in the near term.